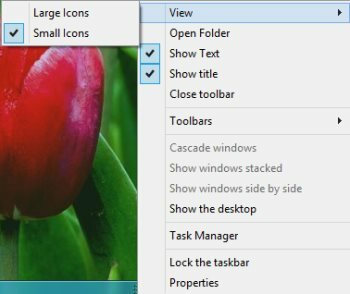 Here is a tutorial on how to get recycle bin in Windows 8 taskbar. Windows 8 comes up with an option to get the recycle bin in Windows 8 taskbar. When you open number of tabs at one time, it actually becomes difficult to head over to the Recycle bin. To overcome such issue, we have come up with an effective solution where you can get a functional recycle bin in Windows 8 taskbar. Basically, a short to Recycle bin. Lets get started with the step-by-step tutorial on how to get recycle bin in Windows 8 taskbar below. 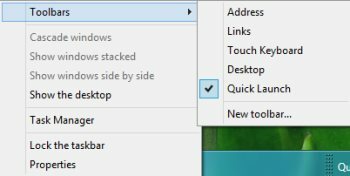 Click the right mouse button on the taskbar, click “Toolbars”?”New Toolbar…” from the appeared pop-up menu. However, make sure that you have unlocked the taskbar. Now, click on “Select folder” . Now, you need to remove the text. To do so, just right-click on the dotted lines to get the context menu appeared. 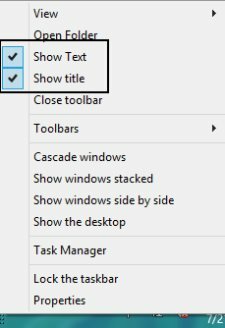 Uncheck “Show Tet” and “Show Title” from the pop-up menu. Once done, you need to make the icons larger. to do so, right-click on the dotted line?hover the mouse over “View” option?click on “Large Icons”. Just drag the Recycle bin to the taskbar. Now, if you want you can delete other shortcuts found on the toolbar. Check out more Windows 8 Tutorials. Yupp…there you are. Follow the above given step-by-step tutorial on how to get recycle bin in Windows 8 taskbar.